Much to my dismay (and after a pathetically pointless internal struggle) I've finally admitted to myself that I will not be running the NYRR Run as One 4m race on April 29. I still can't run for about 2 weeks because of my dumb IT Band, so this race is seriously not happening. But I'm not giving up yet on my May races... I'll cross those theoretical bridges when I come to them. Today I was off from grad school classes so I sort of made it into a "Megan day". Really its just a day where I try to relax as much as possible and do pretty much whatever I feel like doing. A much needed one, I might add. After a nice sisterly morning chat with my long-lost sister Jen on skype (she's away for medical school), I reluctantly changed out of my super comfortable PJs and decided I should do something with my life. So I put on normal people clothes, and in my world that means athletic clothing, and foam rolled the heck of of my leg. Felt good in the painful sort of way. My foam roller. I love to hate it. This photo is during one of our happier times. I also did some stretching and one of the yoga videos I posted recently (the one from YogaDownload.com). I was slightly better at the video this time around, which isn't really saying much at all. My balance is pretty bad in a lot of the poses, which helps explain why I'm always walking into things. But I do feel like this will help my legs and body get stronger if I keep up with it consistently. My sister Jen is really into yoga, so I'm banking on her to keep me motivated. Since I was home today I decided to make myself some nice meals. Usually for lunch I have an almond butter sandwich or turkey sandwich at school. Gets seriously boring day after day but I'm so lazy with making lunches. So today I had an egg with whole wheat toast and greek yogurt with flaxseed and honey for breakfast. Both delicious and surprisingly filling. Kept me full all morning and until my late lunch! 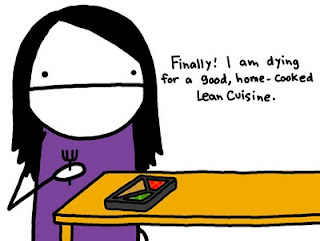 No Lean Cuisine for me today, NatalieDee! Although this is such an easier option than making my own food. My lunch was basically an advertisement for Trader Joe's. Seriously... everything I ate (besides the walnuts) in my delicious salad was from TJs. Guess you know what my favorite food store is. Check it out..
BEFORE: TJs Arugula, tomato, fat free feta cheese, grilled chicken strips, and dressing. I should join their marketing department. AFTER: Those ingredients became this.. which eventually went into my belly. Yum. Tonight I'm planning on making quinoa and black bean burgers with the quinoa I bought from Trader Joe's the other day. I'll let you know how those turn out. I'm not the cooking type of girl per se, so its always risky when I choose to do the cooking in the house. Hopefully I don't burn down the apartment or my eyebrows or anything like that. Seriously, that happens. Gwyneth Paltrow once burned off her eyebrows making a duck rotisserie. See... it IS possible. And I guess that's why a lot of celebrities have personal chefs. The rest of the day I'll probably keep reading the Hunger Games, watch crappy but addicting daytime TV shows like Extreme Couponing (or anything on TLC for that matter), and continue to spend the day with hanging out with my buddy the foam roller. That is, until Karl comes home and I can hang out with a real life person and not a bright orange piece of foam and plastic. Have you ever had any kitchen accidents? What's your favorite thing to buy from Trader Joe's? It was so relaxing and definitely much needed. Finals week is coming up! Ah! I never had the chicken marinara but my boyfriend loves it so it must be pretty good. Eating some food always seems like a good idea at the time, its easy to be swayed! I'm always swayed by ice cream. Always. Haha I have a serious love-hate relationship with my foam roller. So funny that you mentioned the wasabi mayo! I had my eye on it the other day but I wimped out at the last minute and didn't buy it. I'll have to get it next time for sure. I LOVE the mini pb cups they are SO good. Actually, everything with chocolate in it from TJs is usually awesome. They know the deal! Really though you mean laugh at how unflexible I am right? Haha. It was a nice day and I had a good time chatting with you as usual :) Can't wait until you are back! I'll show you how to foam roll, I'm an expert. I'm learning to love yoga. You're right though.. even a few days off and you start to notice tightness. Crazy! I tried to make quinoa black bean burgers the other day and forgot to put the egg in.. bad idea since they most definitely did not stick together. Soo don't forget the egg! Oh no! They are a bit crumbly even WITH the egg so I wonder what they were like without it. I'm probably going to put in an egg white with the full egg next time to help it stay together even a little better. They taste great though! I'm always drawn to that because of the bag! But I've yet to try it because I can probably down the whole thing in a night. It is kettle corn after all!